Can this turn into a modified Grob? Are there any other good reasons to play this? The advice I've heard is that if you're going to play one of these 'waiting moves', so that white effectively becomes black, you may as well play a3. This has the same two advantages that your friend refers to (although preventing the mirror image bishop move, of course), without weakening the kingside. I'm not aware of any other advantages than those two you mention, and of course there are quite a few disadvantages. Obviously this is not perfect opening theory, but at amateur level I imagine it's quite playable. Also, worth noting that Adolf Anderson opened with a3 in a few games against Paul Morphy. So not sure that I agree with Tony Ennis that there are no good reasons to play this way. There are no good reasons to play 1. h3 (or 1. a3) other than psychology (confusing the opponent, avoiding theory/opponent's preparation/...). I don't see this as an argument for playing a waiting move like 1. h3/a3. Why would you want to play like black (which has statistically a lower winning percentage)? What is the advantage of "responding to an opening"? That would mean that you have to be prepared for all kind of moves, so if anything you would have more work, studying more lines, etc. Also I disagree that it is always white who is "creating" the opening. In the end the opening is created by both players. Take for instance 1. d4. 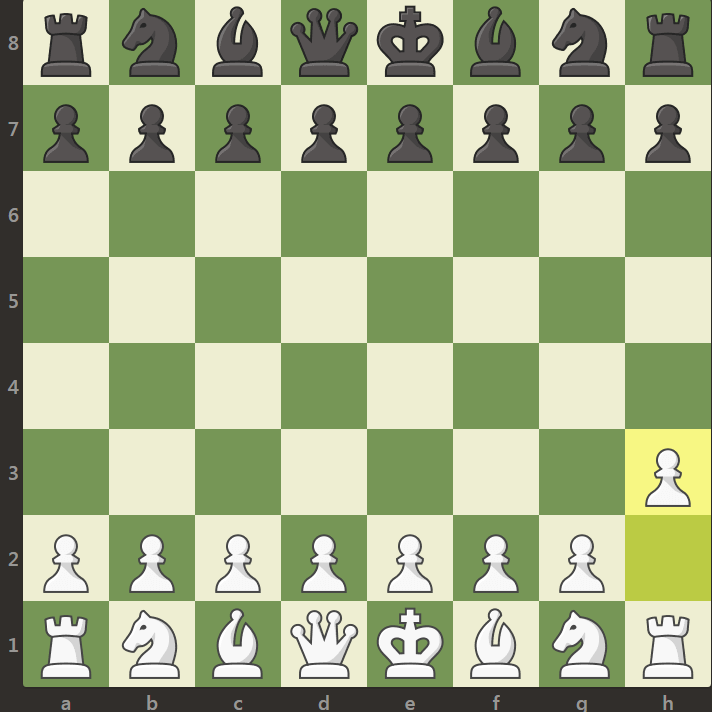 Black can respond with 1...d5 playing some kind of Slav or Queen's gambit which more often than not leads to symmetrical equalish positions. Or black can go for something like a King's Indian, Benoni, Grunfeld... which leads to asymmetric wilder play. So here it is black who decides the character of the opening. It is too early to know whether you want or need to defend against this. It is not like Bb4/Bg4 is a major threat (in most openings) that must be prevented. Also in some openings the bishop might not even want to (be able to) go to those squares. Lastly, pushing the pawn to h3/a3 can create weaknesses or targets for pawn storms in some lines. There are no benefits from playing 1.h3 or 1.a3. There are merely certain variations where White is not severely punished for it. That's not the same as a benefit. The only good reason to play it is that it might somehow confuse an inexperienced player or take them "out of their book". I am not sure that actually qualifies as a good reason. Hoping for your opponent to be incompetent is not a strategy! Not the answer you're looking for? Browse other questions tagged opening pawns or ask your own question. Does playing the King's Indian against the Benko put black at a foreseeable disadvantage?